April – 2017, Leicester, UK. 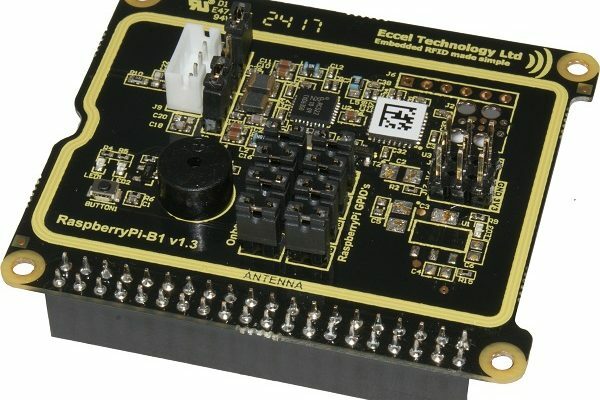 The RaspberryPi-B1 is introduced as a “hat” product to enable users to add RFID/NFC capability to their RaspberryPi designs. It offers full access to all of the features of the RFID-B1 module such as 128 bit AES encryption of data, ADC, DAC, PWM, comparator, voltage reference generator and a temperature sensor. The interface is via the RaspberryPi connector and the board meets the “Hat” standard protocol. ISO14443A transponders are supported including full read/write support of MIFARE Classic®, MIFARE Ultralight®, and NTAG2xx® transponders. Serial number acquisition only is supported for MIFARE® DESfire®, MIFARE Plus® and other ISO14443A transponders. This product will be available for £21.95 in June from our web store www.buyrfid.co.uk or via our worldwide partner, RS Components.